Being a full time athlete can sometimes appear to be all fun and games. After all I get to ride bikes, run and splash around in pools around the world, all day every day. Pro athlete twitter and Instagram accounts are stacked full of pics from training and racing in what look like glamorous locations with all the latest cool kit. There’s no secret that filters work wonders for ones complexion, and they can do the same for the pro athlete lifestyle too! Without wanting sympathy by any means -I do feel fortunate to be in the position I’m in. However, there are also some elements of being an athlete that are tricky. When the fun of racing has died down and the dark winter days are drawing in, the glamour is out the window for a few months and it’s all about the damp, cold and muddy grind. Personally, I’ve had a tricky few weeks recently. I’m coming off the best season of my life, seven months of continuously racing, to then nothing to aim for until March. I know March will come around soon enough – but I was struggling to adjust. I felt like I needed something to aim for and a reason for the early mornings and late evenings. I momentarily lost my usual enthusiasm and it scared me. At the end of each season I have a couple of weeks off – standard. Then as I start training again I’ll have a meet with my coaches and discuss both the season just past and look ahead to next year. My 2016 season exceeded our expectations in terms of winning a World Cup and the European Championships in the first half, however I came away feeling disappointed that I wasn’t able to carry that form on through to the end of the summer. I achieved two world class performances in the space of a few weeks, for some it was a surprise, which then meant I wanted to prove it wasn’t merely a couple of flukes. However, I wasn’t patient enough and instead of listening to Nick and Richard and having an easy couple of weeks mid season I wanted to push on. I was riding a wave of excitement – I was the fittest I’ve ever been and thought I would be able to hold it for a couple more months. I was wrong. Damn, I hate being wrong! I’m writing this blog in a coffee shop looking out at grey skies and rain, knowing that I’ve got to get out on my bike and ride a long threshold session. I’ve just finished a squad swim and I’m looking forward to a hard run session this evening. This is Tuesday. My Tuesday follows the same routine pretty much every week of the year – excluding rest weeks. There’s not much of the perceived glamour of being a full time athlete when you’re getting down to the nitty gritty of a big training block. Don’t get me wrong – I love it. There isn’t a better feeling than when you get to the end of the day knowing you have finished working for the day. For me, I really thrive on routine and a structured training week. From now until the start of the season in March I have a solid 5 months of knowing what my goals are and what I need to do in order to achieve them. For now I need to focus on getting up each day, keeping my head down and getting on with the work. These are the months where I can make a difference to how I perform next season. Each year I review my training and work out whats been going well and what could be improved. A massive area for improvement for me was my strength and conditioning – this winter I’ve introduced a new more focused program to address this, it’s quite refreshing to have something ‘new’ to focus on throughout the week. Thank you to SauconyUK for making my training easier by providing me with the best training and racing gear. The last time I wrote a blog was over a year ago. I had broken bones and the 2014 season looked like it would be a gloomy one. However after a slow start I achieved most of my pre season (and pre crash) goals, my swim massively improved despite the time off and I was pleased with my overall progress and finishing second in the British Super Series was an indication of my consistency though out the season. My best result was 6th in the Geneva European Cup – something I would never have predicted in the April of last year. Through the winter I was able to raise my training up another level. I’m stronger and able to cope with a higher volume now I’ve got a couple of seasons under my belt. I stepped the intensity of my swim training up along with biking and running more miles, going into the early season races I was confident in my fitness and was ready to perform well. The first race of my 2015 season was the European Cup in Quarteria, Portugal. I had been out in Portugal for a training camp 2 weeks prior to the race. On the first day of training camp Richard and I went down to the race site to practice the swim start and exits. Having no experience of racing in the sea I was a little anxious. However, after spending some time each day practicing swim starts and riding the waves etc I felt much more relaxed and prepared for the race. When race day came around there were giant waves, the sea was very rough and I let myself get distracted. My swim was terrible – seasickness and lack of focus was the problem. Usually I spend the entire swim thinking of my technique, I didn’t consider my catch or pressing the water once. Instead I was considering the size of the waves or that I couldn’t focus on the bouys. All my fault, and the race went away from me. After a strong run, I finished 14th – way off my expectation. Lessons learned and experience gained. The British Elite ‘Duathlon’ championships were held on very wet and very very windy day at the end of March. With the bike leg cancelled because of the heinous weather conditions we stood on the line for a 10km run. We ran steady for most of the race then raced the last 2.5k lap. I finished second after a sprint with Emma. 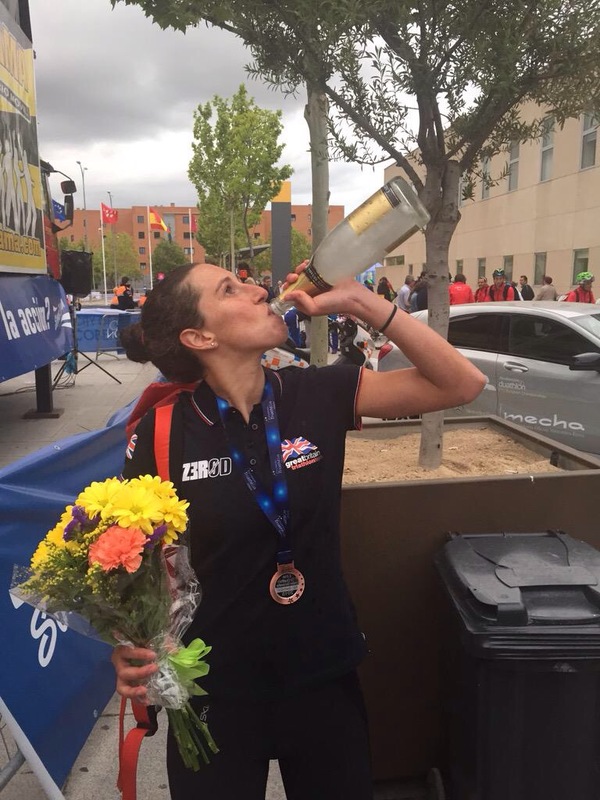 The result of that earned me selection for the European Duathlon Championships in Alcobendas. After another brief training camp I headed out to Spain for the championships, not knowing what to expect. The first run was quick, I wasn’t ready for that – and suffered a lot. I nearly didn’t make it to the end of the first run, but as soon as I got on the bike I had a great time. I made up a lot of lost ground and finished the bike in second place. The final run was tough – a very hilly course and lacking any kind of spring in my step I shuffled across the line to finish 3rd. Cracking!! My first championship medal. After a brief stop over at home to collect my wetsuit and goggles, I hot footed it over to Antalya, Turkey for the next race of the season. There was a little more on the line though – a place at the Rio test event was up for grabs to the top British medal winner. It was another sea swim – a chance to bury the demons from Portugal. My swim was solid, but a couple of tactical mistakes meant I missed the feet of the front pack and I exited the water about 20 seconds down. I spent the first 10km of the bike chasing to catch the lead pack, once I got there I kept pushing on the front to drag out the gaps. I finished with the fastest bike split of the day, sweet! Onto the run, and knowing I needed a podium finish I didn’t want to work too hard over the first 5km, I moved into 3rd place with about 4km to go and maintained my position into the finish. The whole race felt like a composed and controlled effort, which gives me a lot confidence for the rest of the season. My result in Antalya earned me selection to the team for the Rio test event. A very exciting prospect, but I’m under no illusion that there is a lot of work to do if I want to be competitive at that level. I’m not interested in going to make up the numbers. In the mean time there are lots of ITU points to be won, rankings to climb and experiences to gain. I’ll be writing a more regular blog as well as race reports, so watch this space for updates on my progress. I’ve been struggling with what to write about in another blog post. I’ve just been training all winter, so nothing interesting to report really. Until Monday. I was 5days into a 2 1/2 week camp in Portugal, coming to the end of a 3 hour ride in the hills around Vilamora, when BANG… my rear tyre blew up on a decent. The wheel locked up and I went over the handlebars, landing on my left wrist, then rolled and skidded along the tarmac on my hip. Lucky really, seeing as 15m away from my final stopping point was a 50m sheer drop. It could have been worse. I’m definitely not writing about this for they sympathy vote, but because the rest of the day was full of moments of comedy, weirdness and all too good not to share. So, there I am, lying in the road in a tiny Portuguese village. I was riding with fellow cyclist John, who was excellently calm in the situation and called everyone necessary- Thank you!! After a couple of minutes some of local villagers appeared – probably because a bike inner tube blowing up sounds like a gun shot- followed by my screams of ‘oooo ouch, that hurts a bit.’ Must have sounded like someone had been shot. One lady very kindly thought it appropriate to protect my face from the glorious sun beaming into my eyes – so she popped her sun hat over my face. Just to recap – I’m lying in the middle of the road, obviously been involved in a crash, and now my face is now being covered. To anyone passing by it must have looked like I had died!! Classic. I don’t know how long it took, but eventually the Ambulance arrived. They went though all the usual spinal/neck injury checks. Fortunately I managed not to hit my head during my crash, so all ok there. I was picked up and carried/walked to the Ambulance, apparently – I can’t remember the walk, I just remember waking up lying on the ground next to the ambulance. Faint #1 of the day. On the way to the hospital it was established that I was an elite triathlete, and that my left hip had been scrapped raw, and that I had a hole in my new bike shorts. Yeah – I’d ruined my new bike shorts. Annoying. I arrived at Faro A and E, was checked in- and transferred from the bed into a wheel chair, given a pair of slippers (seriously…) and left in a waiting room where I must have been the youngest by 30 years. I was in there for nearly 2 hours, not allowed any food or drink and still not given any pain killers. I nearly reached Faint #2 but managed to breath my way through it, before being called for an X-ray. So, rather pathetically I wheeled myself single handedly (quite literally) to the next waiting room. I should mention that I hadn’t been abandoned by my friends – they had gone back to the hotel to collect my passport and insurance documents etc and were on their way. So, eventually, my friend Tom arrived with all necessary documentation and talked his way past the ogre-esque security guard. Then the fun really began. We were told to go for an X-ray, guessing our way round the hospital corridors we eventually found it. In I went. I needed to move from wheelchair to X-ray stool. Faint #2. They arranged my arm for X-rays, seemingly with little regard that I needed the X-ray because it was broken and so ‘flipping’ hurt. An inability to manoeuvre was not taken into account until Faint #3 happened mid way through setting up. Eventually got through that and was wheeled into the X-ray results waiting room. Still not allowed any food or drink. However, Tom had smuggled in some contraband water, and ensured I was adequately rehydrated. This waiting room was like a scene from a comedy/horror/war movie. About 15 injured people with bandages stapled around different parts of their anatomy. Ranging from a guy laid down on a gurney with blood covered face and banged hand. To an Everton fan (I know this due to his attire), with a bandaged foot. Then a lady with the comedic bandage round the forehead. This room was home for another couple of hours, where almost experiencing Faint #4 of the day. I was now definitely hypoglycaemic – it was 5 pm, Id only eaten half a cereal bar since breakfast at 8.30am and I’d done a near 3 hour ride. Not ideal. But then the most surreal moment happened. A nurse (who looked like a cliche of a nurse) appeared at the doorway, announced my name- I identified myself, she walked over to me pointed to my arm and just said “’tis broken.” In a very drool, emotionless way, then just walked out again. What a way to deliver such a bombshell. Eventually I was taken into the plaster room, here I finally spoke to a doctor about what I had actually done. His diagnosis was a broken Scaphoid, fractured Radius (on the bad side- his words) and a bit chipped off the end of my ulna. Brilliant. Triple whammy. If you’re going to do something, do it well. So, 6 hours after crashing, still without a sniff of painkillers or, more importantly sugar, I was laid on a bed in the plaster room (which can only be described as a messy school art studio, with plaster of Paris on the floor and walls.). Finally a local anaesthetic was administered, and three doctors started pulling my wrist into the right shape. Then a fourth, and fifth arrived. Each of them grabbing a finger each. Mean while, my whole body is shaking (literally), and I’m being told to relax by the junior doctor. Then he leans over and says “this is definitely going to hurt.”. Bed side manner, just amazing. Tom, meanwhile is trying to distract me by pointing out the meat hook hanging from the ceiling (really), and describing the scene outside the window. On my way out of getting plastered, a young doctor appeared from nowhere. He asked me if I was ‘the professional triathlete’ and if he could take my pulse. With no energy to question his motives I obliged. I sat there in the wheelchair, while he sat there opposite me, taking my pulse, asking what my testing heart rate was. ’44’ I replied, this obviously impressed him as i got an approving grin and nod. Having taken my pulse, he gave me my arm back with another approving nod, a wink and smile, and disappeared. I’m sure he maybe hadn’t considered I had just exited the torture chamber having had 5 men pulling my broken bones into the right place. Again, couldn’t make it up! I went back to X-ray, greeted by the same team as before. They were a little kinder with me this time. No more fainting incidents. Just a few jokes that injuries such as mine were a good reason why they didn’t ride bikes. Fair enough. The X-rays showed the plaster and splint were doing their job. I was free to be discharged- after a visit to the vending machine. Where I downed two cans of coke, a cereal bar and family bag of chewy sweets. THE most well balanced meal I’ve ever eaten… NOT. I was sorry to be parting company with my wheel chair, but beyond happy to be heading back to my hotel and friends. Tom had done a great job of packing warm clothes, food and drinks for me. He was also brilliant at distraction throughout the whole hospital ordeal. Thank you Tom! Eventually we found our way out of Faro hospital, then negotiated Faro city rush hour and made it back to the hotel, after another stop off for sugary drinks. I checked by bike over, its ok on the surface – apart from a buckled rear wheel. Everyone on the camp reacted with kindness and offers of help. The best part of the whole thing was my coach of 12 years, Nick Anderson, doing my hair each morning. That’s dedication to your athletes needs and should be part of the coaching manual!! I’ve flown home already, been to hospital over here and am getting fixed up. Initial thoughts are that I don’t need surgery, however I’m being monitored closely and if my bones shift from their current position in the cast, then I will. Fingers crossed. I’m not the kind of person to wallow in self pity, as you can probably tell by the humor employed in this blog. I’ll be honest, I was in great shape, aiming to qualify for the elite World Duathlon Championships. Obviously that’s now out the window. So, I’ll readjust my goals. There are plenty of races throughout the season. Short term goals are to do anything and everything possible to mend, recover and rehab. I’ve already spoken to various people to help with this, including my nutritionist, physio and coaches. There’s a lot to be done. I’ve never broken a bone before, I’ve also never had a serious injury. I’m looking forward to seeing how I react to this new situation, how I’ll learn from it, and how I will take what I learn about my character and apply it to improve my overall training in the future. I’ve got my bike set up on the turbo already, as soon as I’m given the go ahead I’ll be on it as much as possible. When life gives you lemons, make lemonade ay?! I’ve been meaning to start a blog for a long time. Now seems like a good time to start. We’re well into the new year, so it’s not so much a ‘New Year resolution’ blog merely a convenient time to take stock of what happened last year and where I want to get to this year. Last year was full of new experiences and lessons. I don’t want to go back over everything I did as that would probably be boring for me writing and anybody who is reading it. I will give a brief run down of what happened, just to put things into context. This time last year I decided to turn my attention to training for Triathlon full time. This was a risk – mainly because I had never competed in a multi discipline sport, and hadn’t swam competitively for 10 years. With the help of my long time coach Nick Anderson, I devised a plan that could take me from runner to triathlete in the short space of 6 months. This obviously involved learning how to ride a bike, well not quite that extreme, but learning how to ride a proper road bike quickly and competitively. It turned out that I picked that up like a duck takes to water – that was two out of three disciplines cracked, now I just had to learn how to swim. I realised that coaching myself in my weakest discipline was going to get me know where, so I signed up to a ‘Swim Technique Masterclass’ hosted by Richard Stannard. The best outcome of the day was Richard asking if I would like to go and train with him on occasion, an offer I would have been mad to turn down seeing that he has a reputation of being the fastest swimmer in triathlon. So along I went one Tuesday evening, he told me “You’re more that welcome to come and train with me, but I will just set the session and you’ll have to get on with it yourself as I have my own session to do.” I thought that sounded like a good deal, so I dived in and got on with my warm up, only to be stopped 2 lengths in to be stopped by Richard to correct my stroke – ‘get on with it myself’ my arse!! After that session I swim trained with him virtually everyday for 7 months. My stroke was transformed – and I improved quickly, but was no where near ready for the nightmare that is an open water mass start. The races I did last season – ranging from my first ever multi sport race a Duathlon to my first World Cup event all provided me with different lessons and experiences to take away and improve on. Top of the list is obviously to be a stronger swimmer – not only to be quicker, but also to be able to cope with the open water starts where everyone swims on top of you and concentration is key to maintaining good technique. It is obvious that transitions are vital to get right and not loose time, missing the group on the bike can mean your race is quickly over, especially in a drafting event. Maintaining concentration on the run is also key to finishing strongly. As things get strung out, with the stronger swimmers coming back to the stronger runners, the race truly isn’t over until it’s over and that is important to remember!! This coming season I need to build on last years experiences, the good and bad, in order to improve. I want to be more competitive in races and be in a position to use my strengths, then hopefully the results will follow. Well, I hope my future blogs will be more engaging, less cliche filled and hopefully amusing. I felt I needed to write a brief update of my first year before I got into the witty anecdotes about training experiences. I will sneak one in now though. As I have said (yada yada yada….) this was a year of firsts (another cliche…), one of which was my first bike crash. I like calling it a crash because it sounds more dramatic than a mere moment of directional impairment. I was on a morning ride with the Man Machine and cycling geek (sorry…) World Duathlon Champion Alan Murchison. As we were bombing it down a steep hill and around a sharp bend, I swerved to avoid a pothole, and ended up taking an excursion onto the wide grass verge. Enjoying my first taste of Cyclocross, I bumped along for several meters before thumping into a fence post, doing a flip (still clipped in) and finally landing on my back, wheels in the air on a bed of lovely and soft stinging nettles. All the while Alan is still chatting away to me 200 meters down the road. Don’t worry, he isn’t heartless, he checked I hadn’t broken anything before he laughed at me…for the rest of the ride. I’m yet to experience road rash, but if its anything like having both legs covered in nettle rash – I’ll stay away from it thanks!! That’s all I have to say for my first post. Thanks for taking the time to read.